Wishing you and yours a blessed Christmas, from the bottom of my heart! THANK YOU! to those of you who have joined our Of Towers and Turrets online class. Sharon and I have been SO very pleased with the excitement this class generates! The first day of class was the 15th and we're going fast and furious but if you'd like to see what it's all about, click here. Our students are now working on learning how to create their very own Towers collages. Sharon is superb at teaching this part of the class. And then I show you how to make these...fabulous handmade soldered bezels, with cold connected embellishments; poured with resin. Registration is still open...click here. We would LOVE to have you come play with us! Oh, and here's a silly little video I dug up for you to see. 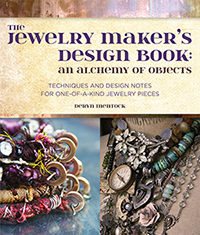 We were goofing around, having fun, in the planning stages of this class but it gives you a peek into my jewelry journal....which is a whole different class I have in store for you! Here it is...the very last day of this year's 12 Days of Christmas Ornaments swap. Today is my friend Jackie Allison's day. Jackie was one of the original ornament swappers, way back in the day. She's made some amazing mixed media artworks, over the years. Her kindness and goodness shows through in everything she does. The tiniest, sweetest, little Charlotte you've ever seen! It's hard to believe our ornament exchange is over for another year. But wait!...I haven't posted my ornament. Yes, I'm still working on them, slowly and surely, as my shoulders allow. I'll post them when they're finished but I can't make any promises that it will be before Christmas! It's been a fun swap...thanks for tagging along! Day Eleven belongs to my sweet friend, Maija Lepore. I love this woman! How could you not? She's a friend to absolutely everyone. She can be seen schmoozing at the many art retreats across the nation. She's been a wonderful, loyal and protective friend to me and flattered me by buying one of my favorite (and most personal) pieces of jewelry, right off my neck! She's a gem of a lady and I'm SO glad to know her. This year, Maija sent us these adorable, sparkly, retro houses created by her friend, Jenny Holiday. They remind me of those adorable Japanese, paper Christmas villages from the '60s. The white painted bottle brush tree on the side is such a cute touch! Tomorrow is the first day of class: Of Towers and Turrets! It's not too late to register, click here. Registration is open until Jan. 15th. I'm excited! ...boxed and tied with a piece of silk. Diane was so gracious to take my place in this swap, at the last second, when my shoulder gave out. I knew she would do a fabulous job. It's one of Diane's lovely thimble tassels. Honestly, I can't believe she made 12 of these! ...and look at this, a teeny, tiny metal book with "deryn" stamped on the front. I bet those are Bible pages inside. Do you not love this awesome ornament? Tons of time, work and consideration went into it. And, it shows. I want to wear it as a necklace...and probably will! The ninth day of ornament swapping belongs to amazing mixed media artist Danita. I've been in love with Danita's artwork for a long time. Her style is unmistakable...colorful and whimsical...it speaks to me! I always look forward to opening Danita's package and adding one of her wonderful characters to my collection. This year, Danita's ornament is a confection of wax, paper, ink and I-don't-know-what-all. It's a gorgeous thing all done up in soft, subtle colors. The focus is a sweet and lovely angel, protectively holding a tiny log cabin. At least, it looks like a log cabin to me. It makes me think of my family cabin in the Big Horn Mountains of Wyoming, surrounded by forest. Lots of wonderful memories have been made at that cabin and a little bit of my heart resides there. I imagine it's snowing up there this time of year and I often envision what it would be like, tucked away in the snowy silence with the wood stove blasting. I think Danita's images have a way of evoking memories and emotions in the viewer. That's what makes her work so amazing! Lou always comes up with ideas I would never think of...so creative...and don't you love that vintage German text? ...it's a waxy wonderment! When Sally described her ornament making process to me, I had to laugh. She took a rather circuitous route to get to the lovely end product. I was wondering how she made this beautiful star and it turns out there were about a-bazillion steps involved. I couldn't begin to figure it out but, Sally did...and I love it! Don't look now but it's day 6 of our 12 Days of Christmas Ornaments swap and my dear friend, Crystal Neubauer, is our artist of the day. Crystal is an amazing mixed media artist. I say mixed medium because she works, beautifully, with many different materials...paper, wax, wire, metal...to name a few. I originally met Crystal online but had the pleasure of getting to know her better when we roomed together as teachers at one of the national art retreat venues. I was drawn to Crystal's love of Christ and kindness and we immediately became fast friends. I admire her talent and style, not to mention her calm and quiet way. And all of this in a sweet and humble spirit. In spite of any unsettling waters that may swirl around her, I really believe Crystal to be a rock...the kind of person you can count on for comfort and strength...a good friend. ...a hand-painted swan (goose?) ornament...as in "seven swans a' swimming" or "six geese a' laying." I told you this gal is talented. This ornament is a treasure. Reminder: registration is still open for my online class Of Towers and Turrets. Class begins Dec. 15! Click here for registration.